From the publisher: "Knowing exactly when to start vegetable seeds indoors, transplant them into the ground, pinch off the blossoms, and pick for peak flavor is the secret to enjoying bountiful harvests all through the season. In "Week-by-Week Vegetable Gardener's Handbook," authors Ron and Jennifer Kujawski eliminate the guesswork with weekly to-do lists that break gardening down into easily manageable tasks. Suitable for all gardening zones, the book offers easy instructions for setting up a perfectly personalized schedule based on your last frost date. Whether you're wondering when to plant strawberries, check for tomato hornworm, or harvest carrots, you'll see at a glance exactly when and how to do it, for the biggest yields and the best vegetable-growing experiences ever." I love that since it's spiral-bound, it sits flat on the table or ground for me to refer to easily even with dirty hands. And I loved too that they share illustrations rather than photos, so they could show the right level of detail and close-up on every task that needs an illustration to explain. Because it is organized by week, the tasks are broken down into manageable chunks and now I am not worried I will forget anything. There are also a ton of helpful tips and basic explanations for beginners like me. I also like the spaces to write down your own notes, so the book doubles as a gardening log/journal, which keeps all the helpful info in one place. I have read many books on gardening over the years and most have covered various topics. 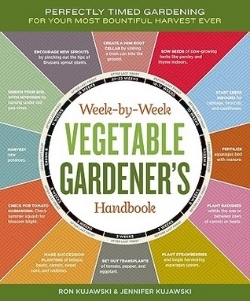 With great pleasure, I must tell you, The Week-by_Week Vegetable Gardener's Handbook, covers EVERYTHING you need in this one book. It has been a long time coming but worth the wait. I really enjoy how the book is set up. At the top of the page it will say how many weeks before or after average frost date. For example "10-15 weeks before average frost date" and then it will state the tasks that you need to do. All you have to do is read through the rest of the chapter as they elaborate on the things that were listed. I will definitely be keeping this book as a reference for many many years to come. I'm a garden writer and was lucky enough to get to hang out with the editor of a big name garden magazine recently, after writing an article for their magazine. She mentioned that they had gotten in about 40 books just on vegetable gardening that spring, and how shockingly many books on the topic are published each year. I asked her which of the newest crop stood out as being truly different, and this was one of the two she mentioned. Ron and Jennifer Kujawski are a father-daughter gardening team. Together, they tend a 2,000-square-foot vegetable garden in the Berkshire hills of western Massachusetts. Ron is a horticultural consultant, writer, and lecturer who served as an Extension Educator for the University of Massachusetts for 25 years. He is also the author of a popular syndicated gardening column called "The Gardener's Checklist." Jennifer holds degrees in botany and horticulture and works as a freelance writer and editor for a variety of organizations, including the University of Massachusetts Extension, the USDA Forest Service, and the Massachusetts Nursery and Landscape Association.